Prior to 2007, Lucky Strike cigarettes were most likely to be purchased by rockabilly scenesters looking to complete their outfits, or drunks who just confirmed for the third time that, no, they’re out of all Camels except for Crushes. 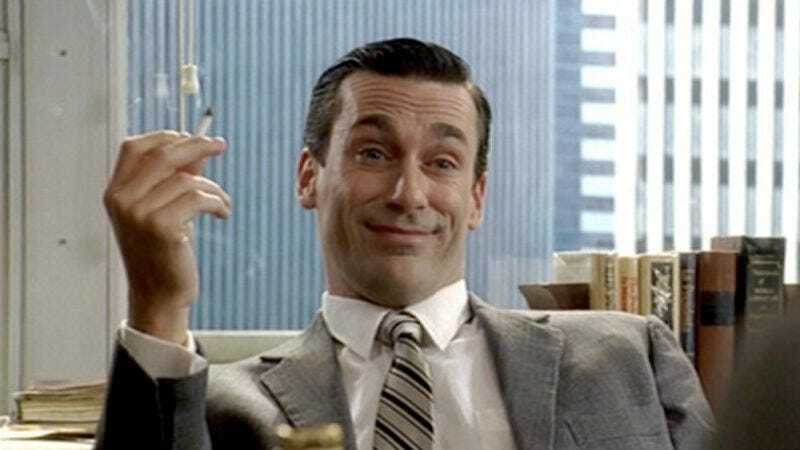 But then came the first episode of Mad Men, with all of Don Draper’s waxing lyrical on how Lucky Strike’s particular brand of carcinogen was deliciously “toasted.” Nearly seven years later, sales of Lucky Strike are up by 50 percent. The Ivey Business Review suggests there’s a connection rather tentatively, noting that crediting Mad Men for driving Lucky Strike sales sounds like “typical advertising puffery” (womp-womp), but that it’s also hard to point to anything else that might be responsible. After all, the company hasn’t done anything remarkably different in terms of creating new products or infiltrating new markets—no more than any other brand, anyway—yet its sales increases are fairly incredible for a cigarette some might be surprised to know still exists, outside of ’60s period pieces and photographs of their dads. The same article also suggests a similar boost for Canadian Club Whisky, which had been in a 17-year slump before Don Draper started ordering it by name on your television. Since then, sales have been steadily climbing, aided by the positively Draper-esque “Damn Right Your Dad Drank It” ad campaign—that, not coincidentally, relied on vintage, Mad Men-esque photos of ’60s-era guys downing Canadian Club and cozying up to girls in miniskirts—as well as its bottles’ appearances on Boardwalk Empire. And while a spokesperson for the company said they couldn’t attribute all of its recent success solely to Mad Men, they did admit that it’s “made a huge impact on the brand… People are talking about it again.” In short, you can credit Mad Men for the nostalgic revival of two of the most beloved vices that will eventually kill all its characters.